It’s not perfect, I realize that. I would do many things differently if I were to do this project over again. I still want to add a couple more borders and then quilt it. I want it to be ready by the time I teach a multi-hooping class Aug 23. –Start small. 2 hoopings would be great. –The fewer colors the easier it is to follow. –If you have a machine that has “perfect positioning,” rely heavily on that. –Grid your fabric before starting so you know what is absolute horizontal and vertical. I always tell my students that if you’re not making any mistakes, you’re probably not learning anything new. Mistakes, errors, booboo’s and unstitching are the hallmark of a learning curve. Ask me how I know. Rare is the person who sits down and implements something new perfectly. And if they did, they probably didn’t try something challenging enough. Who knows what you’ll be able to create once you move past the fear. 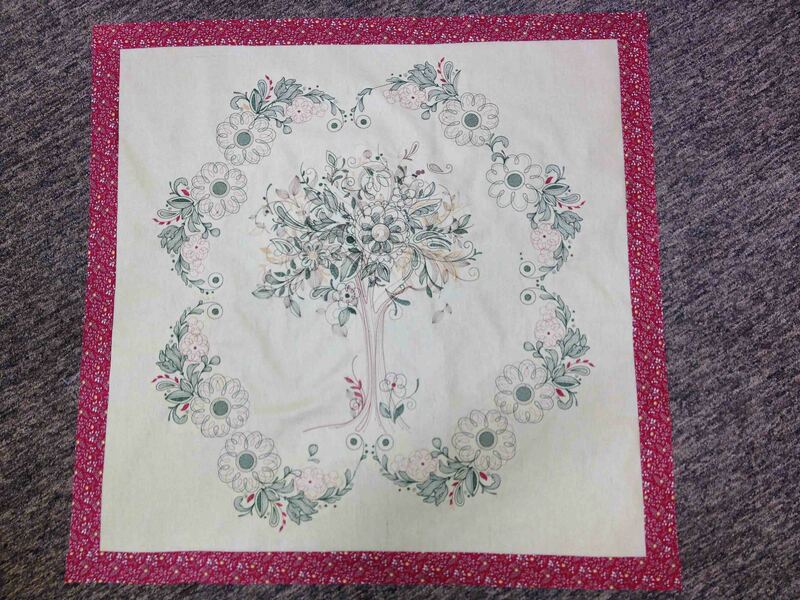 This entry was posted in digitizing, embroidery, machine embroidery, quilting, sewing and tagged Bernina software, machine embroidery, multi-hooping by edges. Bookmark the permalink.